Fit mom featured blogger, Kate. 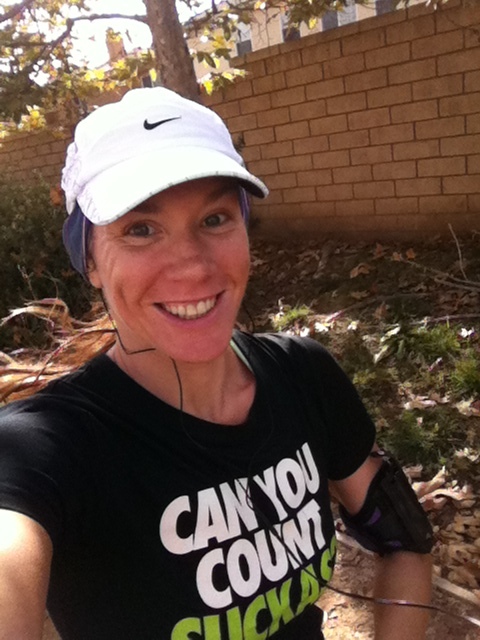 I am thrilled to introduce you to fit mom blogger, Kate, from chroniclesofkatedotcom! She has a fabulous perspective and great writing style. Enjoy getting to know Kate and what she thinks about excuses! This is how I have been treating myself lately. It’s sad, and I know I am just feeding myself a line of made up nonsense every time I know I should be running. I turned into the gal who I told myself I would never become. In the past 5 months, I have become lazy, unmotivated and upset with myself because my clothes don’t fit me right. Well guess what? I will not do this to myself anymore! I am a very enthusiastic, adventuresome, spontaneous, excitable girl. I also have duties which mold my life into what it is. I spend all day of my life as Mom. I spend part of my life as Student, and part of my life as Waitress. Always though in my life and usually intertwined into all three of those roles is, Runner. I have been known to squeeze in runs between soccer practice and dinner time, before the family wakes up on Sunday morning, and even on my way to school. Squeezing in time to run in this fashion is not uncommon for a runner, but being a runner who doesn’t run is. I enjoy reading and learning about others’ running experiences almost as much as I enjoy my own. I also love running races. I can (and do) sit for hours looking up my next big race, and daydreaming of how It’s going to be awesome while I run in an out of the hills of -insert race town here-. I’m a dreamer, and there is nothing wrong with it, but as I’m planning out my next 50k race, I can’t even run 2 miles without wanting to turn around and go home. This is the problem. And as big-headed or overly confident as it sounds, I have never had this problem before. Five months ago I completed my last race. It was a 50k that I trained months for. I went on a vegan diet for the race, and I had a run scheduled into almost every day of my weeks leading up to it. I felt good, and I felt like a runner. Now I feel bad, and I don’t feel like a runner at all. So here is the beginning of a new start for me. In the last few days I came up with a mantra, if you will, for me in the attempt to make myself better, for myself. No one can do this for you, you must do it yourself. I have things to do and races to run in my immediate future, and I cannot and will not allow the horrible excuses to take over me again. Watch out for me world! I’m (on my way) back! That is almost as awesome as you are!